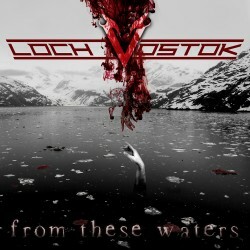 Review: "Loch Vostok: From These Waters" - Sea of Tranquility - The Web Destination for Progressive Music! Album number six for this Swedish progressive extreme metal band sees the line-up of founder Teddy Moller (vocals & guitars, ex-Mayadome drummer), Niklas Kupper (guitars, vocals), Fredrik Klingwall (keyboards), Jimmy Mattsson (bass), and Lawrence Dinamarca (drums) once again blending death metal, progressive metal, thrash, and melodic rock for a sound that at first might sound all over the place, but once you give it a chance it all makes a hell of a lot of sense. From These Waters finds the band on Vicisolum Productions, home to a roster of very eclectic talent. "Like Poison to the Stars" and "I Implode" both hammer home the intent of this album right from the get-go, as the band launch into frantic rhythms, crushing guitar riffs, and a varied mix of growls, screams, bellows, and clean vocals. The title track should easily appeal to fans of Soilwork, Fear Factory and Mnemic, as catchy hooks, industrial styled keyboards, and modern metal riffs attack the senses. The same is true for "Fighting Fire With Blood", as manic, thrash arrangements battle moody, atmospheric sections for supremacy. It's catchy but extreme at the same time, and almost reminds of Scar Symmetry thanks to some technical guitar wizardry. "Lost in Transmutance" and "Dead Sea Trolls" both offer plenty of progressive death metal tendencies (Moller's growls are extremely well done here), while "And the Storm Spread Its Wings" almost feels like a long lost Symphony X song, except with Moller spewing his venom over the top. For balls to the walls fury, it's doesn't get much better than the intense "Sentiment", and "Me Forgotten" is easily the mellowest track on the CD, a spooky, atmospheric slice of melancholy that fuses prog rock, doom, modern rock, and black metal for an intriguing listening experience. To close it all out the band offers "They Brought the Dark", an epic sounding prog metal adventure littered with intricate guitar & keyboard patterns, brutal riffing, and maniacal vocal sections. After a decade or so together, Loch Vostok seem to have really found their footing here on From These Waters. Though they've got a solid discography under their belt already, it's here on this latest that it all seems to have really come together. Plenty of variety to be found here, so if you like your progressive metal with lots of extreme elements, you've come to the right place. See more about this release on our recent YouTube show!